I hoped to create something that would taste like the real deal, but I was expecting it to be somewhat inferior to the original. How wrong I was, this vegan salted caramel sauce was equal to, if not better than the full on cream and sugar version. In fact, the original tasted unpleasantly sweet after trying this sugar-free version. The sweetness comes from malt extract, medjool dates and the caramel flavour from both the dates and maca. Coconut milk would probably be the best milk to use in this vegan salted caramel sauce, but I only had hemp milk to hand. The fat element was provided by coconut oil. Rather than straightforward sea salt, I used smoked sea salt to give a gorgeous hint of smokiness. My trusty Optimum 9200A power blender whizzed everything to a super smooth consistency and the sauce was duly poured over pancakes and served with raspberries. You’ll find the recipe near the bottom of this post. I received the maca powder from Indigo Herbs as one of their new summer offerings. Indigo Herbs is a well established online shop selling ingredients promoting wellbeing. I highlighted some of their spring range of products in my post on how to make your raw chocolates more interesting. Maca is a high altitude superfood root from the Andes. It tastes slightly bitter but with a strong malty, caramel flavour, which makes it perfect for vegan salted caramel sauce. Mostly, I add it to morning smoothies. Maca is said to be good for the adrenals and have a calming effect on the nervous system. It’s particularly useful to take in the summer as it’s good for desensitising skin and enabling it to cope with extreme temperatures. £3.99 for a 100g pack (other sizes available). I use a lot of cold pressed organic coconut oil and I’ve written about it many times before. The product is versatile and is said to have many health benefits. It has a high smoke point, so is good for frying, it makes an excellent alternative to butter in baking and it’s a saviour for raw food enthusiasts. Coconut oil is also good for oil pulling. For those not in the know, this is an Ayurvedic technique for cleaning your teeth which involves swishing a tbsp of oil in your mouth for ten minutes or so. It’s said to prevent tooth decay, strengthen and heal bleeding gums and cure cracked lips among a host of other benefits. You’re meant to do it 3-4 times a week, I only remember to do it about once a month. £7.49 for a 500g jar. Turmeric is something else I use a lot of. I add it to curries, soups and smoothies. It’s well known for being an anti-inflammatory and is meant to help ease the symptoms of arthritis. As my joints get creakier as the years pass by, I’m trying to be more consistent in my dosage. The idea is to have a small glass of turmeric milk every night before going to bed. I haven’t yet developed the habit, but I’m determined to get there. £3.99 for a 100g pack (other sizes available). Spirulina is a great multi vitamin and detoxifier which makes it really useful to counteract the effects of all that summer socialising. Whilst it’s easy enough to add spirulina powder to your morning smoothie, these tablets are convenient for taking on holiday with you; they’re packed in a sturdy resealable pouch. £4.99 for a 100g pack (other sizes available). This mix of fennel seeds, liquorice root, nettle leave, dandelion leave, red clover and ginger powder is designed to uplift and cleanse the body of toxins. I’m always up for a bit of detoxification. Simply pour on hot water and allow to steep for a few minutes. It’s surprisingly sweet with some ginger heat and as a liquorice fan, I really like the flavour. £3.99 for a 50g pack. A super delicious raw vegan sauce that you can easily make to the consistency you like - a pourable sauce, a stiffer spread or even icing for a cake. 250-400 ml dairy free milk of your choice , depending on how runny you want it. Put everything into a power blender and blitz for 30-40 seconds - I used my Froothie Optimum 9200A. Pour or spoon into a jar and use immediately or store in the fridge for a week. It will get thicker as it cools. Yields one medium sized jar. Use 250ml milk initially and then add more as needed. I’m sharing this smoked salted caramel sauce with Recipes Made Easy for #CookBlogShare. Thanks for visiting Tin and Thyme. If you make this vegan salted caramel sauce, I’d love to hear about it in the comments below or via social media. Do share photos on social media too and use the hashtag #tinandthyme, so I can spot them. For more delicious and nutritious recipes, follow me on Twitter, Facebook, Instagram or Pinterest. 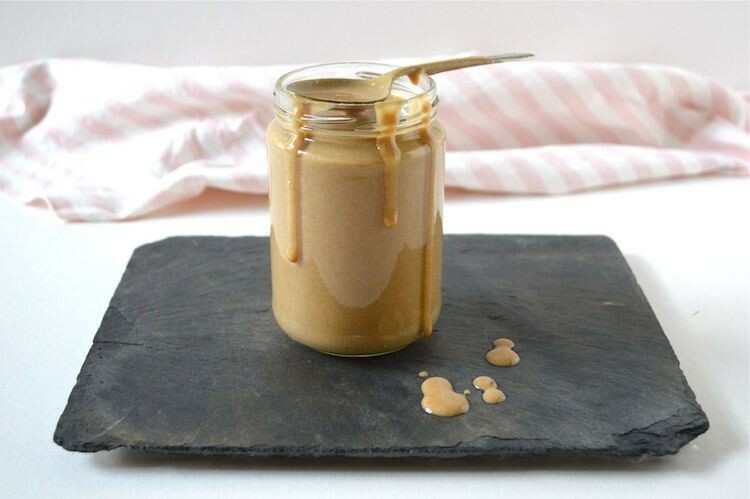 Vegan Salted Caramel Sauce. PIN IT. Thanks to Indigo Herbs for sending the products to try. I use a Froothie Optimum power blender for smoothies, spreads, sauces and even chocolate making. The post contains affiliate links. Buying through a link will not cost you any more, but I will get a small commission. This helps keep Tin and Thyme blithe and blogging. Opinions are, as always, my own. That sauce looks incredible!! So thick and delicious. I would lick it straight from the spoon (or my finger!) and then pour it on everything! Such a creative vegan caramel sauce! I love the maca in there. Thanks Angie. The maca really helps to give the caramel notes. Oh I think I need some of that maca, I definitely need desensitising. My skin has been playing up recently, although hoping some sunshine will wctually help! Your trip to France must be coming up soon Janice. You should get plenty of sunshine there. This does look delicious! I’ve never tried macaroni, I’ll look out for it! I find it best used in small quantities Kavey. 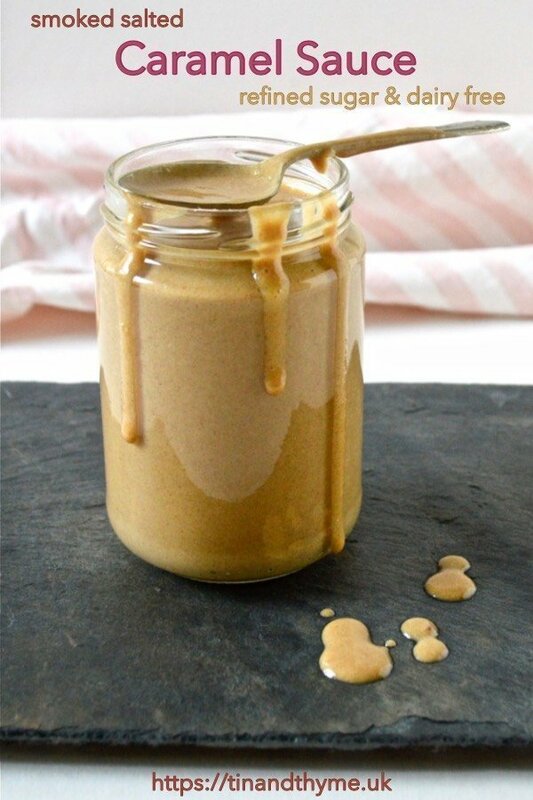 Wow this vegan salted caramel sauce looks delectable , it would be perfect drizzled over icecream too. I adore anything caramel and anything smoky, so the idea of having the two together is right up my street. Really does sound fabulous! There’s already some maca in my pantry and I’m picking up some smoked sea salt asap! It’s a very subtle smoky note as such a small amount of salt is needed, but it’s definitely there and is totally delicious. I really like making my own sauces like this out of superfoods. You get all the taste and all the nutritional benefits too. Yes, it’s a total win win Jemma and usually so quick too. Oh no, in what way haven’t you had success with dates Johanna? I tend to add maca to cakes and other bakes as well as to smoothies. This looks amazing and it’s lovely to read that it tasted as good as the “real thing”! I wonder what a good replacement for the malt syrup is in this recipe, do you think maple syrup would work? Malt Syrup isn’t gluten free :(. The tea also looks and sounds incredibly delicious. I wouldn’t say the sauce tastes the same, but it’s certainly as tasty. Good point about malt syrup. You could just use a couple more dates or some maple syrup maybe. An inspired recipe, Choclette! Maca powder is an ingredient I have never tried. Would love to try your fab-sounding sauce. Thanks Galina. Maca has heaps of nutritional benefits apparently the and sauce is brilliant as it only takes five minutes to make. I am trying to use more and more of the healthy things in my food like turmeric, coconut oil, blue agave syrup and loads more. Careful with agave syrup Heidi, I’ve heard it’s not all it’s cracked up to be. This sounds really interesting and looks amazing Choclette. How important is the malt syrup? It’s not gluten free, so wondering what would be a good substitute? Thanks Kate. I added the malt extract in for an extra ‘caramel’ hit’ and bit of sweetness. I’m sure an extra date or two would work instead. What a creamy and delicious sauce and sugar free too, I avoid sugar so am always looking at alternates to add that sweet taste. I love turmeric in warm milk – it is my go to home remedy to beat my chronic cough and cold! Ah Manjiri. I’ve just discovered your comment. I didn’t know you didn’t eat sugar. It’s certainly a good idea to reduce levels of this very addictive substance. I’m not very good at it. I’m with you on turmeric milk, it’s a great drink. I love salted caramel – making it vegan and healthy is definitely a bonus! Thanks Cathy. Salted caramel really is one of the best things ever. I would not have thought of using smoked salt in caramel I must give it a try. Happy New Year and thank you for linking to #CookBlogShare. Thanks Jacqui. Oh it’s lovely. Salted caramel is so good anyway, but this gives it a bit of a sophisticated lift.